Molotov Cocktail's terpenes are more subtle in this strain, but a clear sour and sweet mix eminate from these beautiful buds. Well-recognized and prized lineage. Buds break apart nicely and evenly. 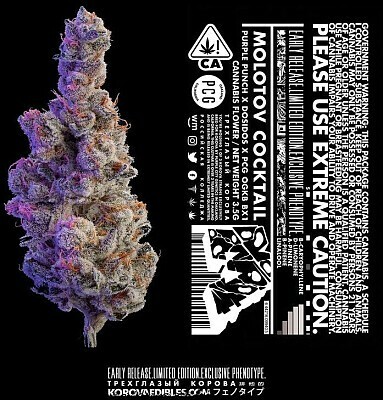 1 of 3 new strains in the Korova collection, The 3 Russians. Early release. Limited edition. Exclusive phenotypes. Genetics handpicked from Purple City Genetics in Oakland, CA.